Imafidon is an enterprise collaboration strategist at Deutsche Bank, working as a consultant. 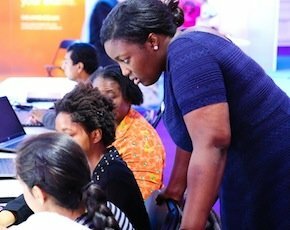 She also founded Stemettes, to inspire the next generation of women into science, technology, engineering and mathematics via a series of panel events, hackathons and through the media. The campaign has reached 600 girls in less than a year. She is also a board member at Inspirational You, a Fellow of the RSA and director at Avisami. She won the FDM everywoman Rising Star of the Year award 2014 and was also highlighted as a rising star in Computer Weekly’s 2014 list of the 25 Most Influential Women in UK IT.